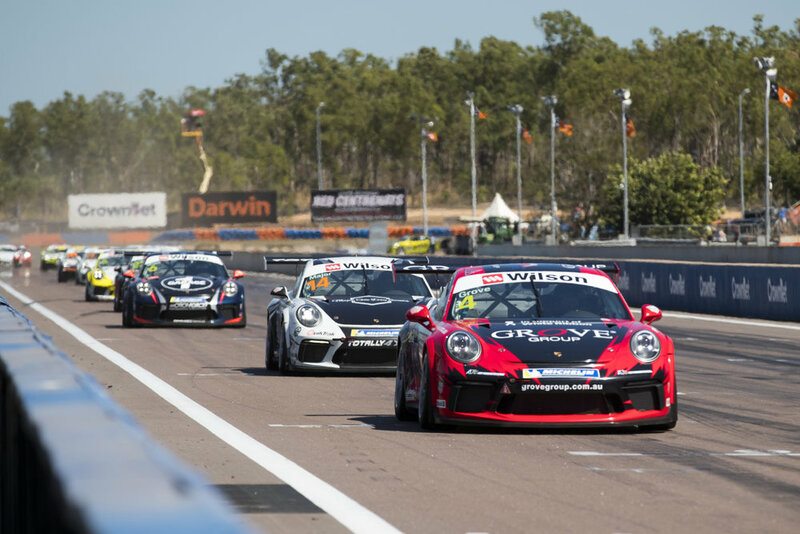 A consistent weekend at Round 4 of Porsche Wilson Security Carrera Cup Australia around Darwin’s Hidden Valley Raceway has brought Stephen Grove within seven points of the Pro-Am class standings lead. Grove picked up the round win after holding his own near the front of the outright field throughout the weekend. The Melbourne-based driver qualified on pole in the Pro-Am class with a lap that put him within half a second of the overall pole time, placing Grove ninth on the grid for the opening race. After a clean start, the 2017 class champion led Pro-Am for most of Race 1 before dropping to second in class in the latter stages to finish 11th outright after fellow racer Adrian Flack got by him. In a chaotic Race 2, Grove managed to retain second in class, despite nursing a puncture in the closing stages of the 18-lapper to cross the line an impressive eighth outright. Things turned around though in the endurance format Race 3 which took place over a mammoth 35 laps in the Darwin heat, where Grove snatched the class lead in the dying stages to clinch the Pro-Am race win and seal the round win. The result is Grove’s second round win of the season and a welcome return to form as he hones in on his third class championship with four rounds still remaining on this year’s Carrera Cup calendar. “Another round win is great,” said an elated Grove. “It’s been a hard weekend and it’s really tough; you had to work really hard at it this weekend as it had a mixture of everything. “I’m rapt for Adrian Flack as he did a great job with two class wins and to be up on the podium. It’s been a good weekend. “It was probably one of the tougher weekends I’ve been involved in for a while because it’s such close racing,” he added. “This track is short and fast, you can’t make a mistake, we were really close to the front guys and every race I think I was as fast as the front guys. “So you’re racing Pro-Am drivers and you’re racing full Pros, so yeah, there was a bit going on. “Up in Darwin here, it’s very, very hot and that 35 lap race was really hot and long and hard work. “You just had to keep consistent with your times, manage your tyres and you needed to do to get through to the end. “In the first race, I was quite quick for the first nine or ten laps, but then it sort of went off pace wise, so that’s when I lost the lead in that race. “I had enormous oversteer, I just couldn’t race with him, so we consolidated second there. “We tuned the car up and Race 2 was good, despite the puncture we had right at the end. “On the last lap sort of I felt it go off but we held onto it until the chequered flag. And then the car was amazing in Race 3 where we got the win. Round 4 of Porsche Wilson Security Carrera Cup Australia takes place at Sydney Motorsport Park from August 3-4.